Despite making a winning start to the La Liga season, Real Madrid are reportedly considering a swoop for Valencia’s Rodrigo before the transfer deadline. Los Blancos bounced back from their disappointment in the UEFA Super Cup clash with Atletico Madrid to pick up three points at home against Getafe to get the league campaign off to a positive start. However, question marks still remain over their ability to compete for major honours this season, as they’ve opted not to replace Cristiano Ronaldo to this point after he completed a summer move to Juventus. Given the impact that the Portuguese talisman had in terms of goals alone, it’s questionable as to whether Real Madrid can solely rely on the likes of Gareth Bale, Karim Benzema and Isco to contribute more goals and so it has led to late claims that they could sign a new forward before the August 31 deadline. According to AS, Lopetegui wants Rodrigo to help fill that void, although with his €120m release clause, it’s suggested that Real Madrid are only willing to splash out half of that at around €60m to prise him away from their La Liga rivals. That would seem like a sensible approach given that the 27-year-old hasn’t been overly prolific at Valencia since joining from Benfica in 2014. After 45 goals in 120 games in Portugal, he has now bagged 38 goals in 136 games for Valencia, bagging 19 last season to build some real momentum and earn a place in Spain’s World Cup squad. 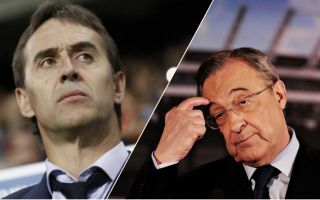 However, €120m is a significant fee for a player who hasn’t proven himself consistently at the highest level, and so it remains to be seen whether or not Lopetegui can convince Madrid to find a compromise and in turn if Valencia are willing to sell so late in the window.